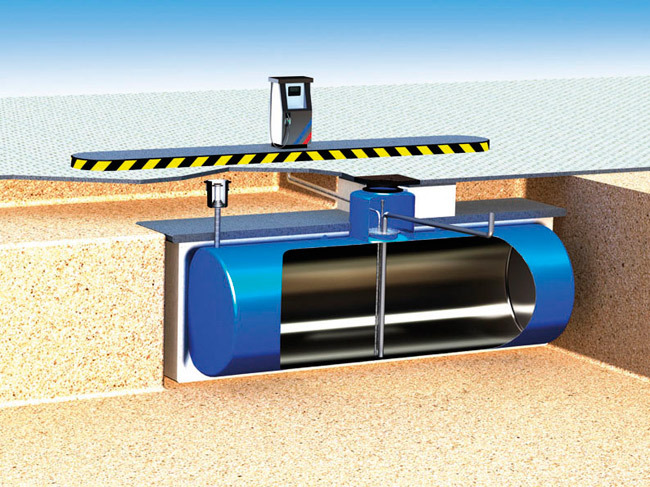 Forgeweld’s composite bonded underground storage tanks offer problem-free performance without any external corrosion monitoring. Combining the structural integrity of 6 mm SABS Grade 355JR carbon steel plate with the corrosion resistance of a 2,5 to 3 mm Fibreglass Reinforced Polyester (FRP) shell (Spec UL1746), these tanks have high tensile strength and impact properties and are recommended for the safe storage of all blends of conventional and oxygenated fuels, including methanol. Forgeweld Composite Bonded Steel Tanks are built with shell-and head-thickness to SANS 1535/UL 58 specifications. Before application of the GRP laminate coating, the external surface of a tank shall be blast-cleaned to preparation grade SA 2,5, as described in ISO 8501-1 (as per SANS1535 standard). A 2.5mm coating of isophthalic resin reinforced with chopped fiberglass is applied to the entire external surface of the tank (UL 58). The finished cladding is quality checked by a 35 000 volt holiday test over 100% of its surface to ensure that there are no discontinuities in the coating. Forgeweld composite tanks are fully insulated from the surrounding soil and are equipped with isolating bushes. No cathodic protection or corrosion monitoring is required. Combining the structural integrity of 6mm SABS Grade 355JR carbon steel plate with the corrosion resistance of a 2,5 to 3 mm Fibreglass Reinforced Polyester (FRP) shell (Spec UL1746), these tanks have high tensile strength and impact properties and are recommended for the safe storage of all blends of conventional and oxygenated fuels, including methanol. • Fitted with lifting lugs or flanged or dished ends. • Top 745mm diameter manholes incorporate filler, dip, breather and pump-suction apertures. • A forecourt manhole can be supplied if required. • Drop pipes are also fitted to order. • UL 1746 Part II – Composite Tanks – This standard covers the material testing and application of the 2,5 mm FRP coating applied to the external surface of every Forgeweld composite tank. In terms of this standard, the application of a 2,5 mm FRP coating allows manufacturers to reduce shell tank thickness. We don’t exercise this concession, thus ensuring that the structural strength and integrity of our composite tanks exceed that called for by this standard. The steel used in the manufacture of our composite tanks conforms to this specification. Forgeweld composite-bonded USTs are supplied in standard sizes ranging from 4,5 m3 to 46 m3. Larger units can be manufactured on request.